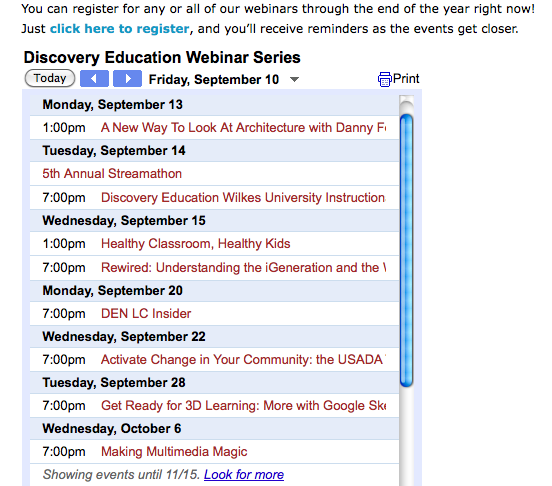 Discovery Education Webinars has its mojo working with a week of terrific professional development opportunities. Your PA bloggers want to make your access easy, so you might want to check our DE Webinars tab on our blog for a complete and updated list of Discovery webinars. Each week we’ll try to give you a visual reminder via a post that highlights the week’s events, so continue to check back. You can also follow us on Twitter. We’re also on Facebook, but that’s another post. Here’s your easy access for registration with brief session description. Hope to see you there. Remember: all times are Eastern. Discovery Channel‘s Season 4 Build It Bigger videos free by clicking here. What a great way to introduce your students to their webinar participation. Register for this webinar today. 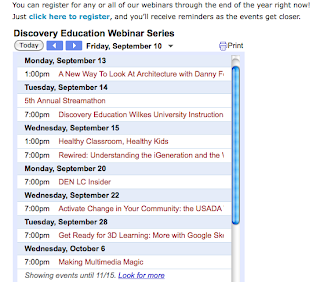 If you missed Discovery Education’s summer institutes or back-to-school webinars, here’s your chance to catch up on the latest and greatest ways to integrate Discoverystreaming and the DE products into your curriculum. Join us for the Fifth Annual DEN Stream-a-thon. 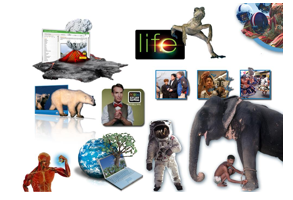 Welcome to 10 intensely interesting information about integrating digital content from Discovery into your curriculum. Safe vetted video content, with a host of other affordances you can’t afford not to use. Check out the day’s schedule here and register now. Just when you think the Discovery day is ended, think again. (That’s what I love about DE–delivery of excellent content, outside the box–thinking again about what is relevant, authentic learning and teaching) Join us for one of the exciting DE Webinars 101, tonight featuring Discovery Science Elementary 101. This is just one of the products that the Oregon Public School system adopted as its curriculum for this year. Click here to register. Learning with the very best teachers online! 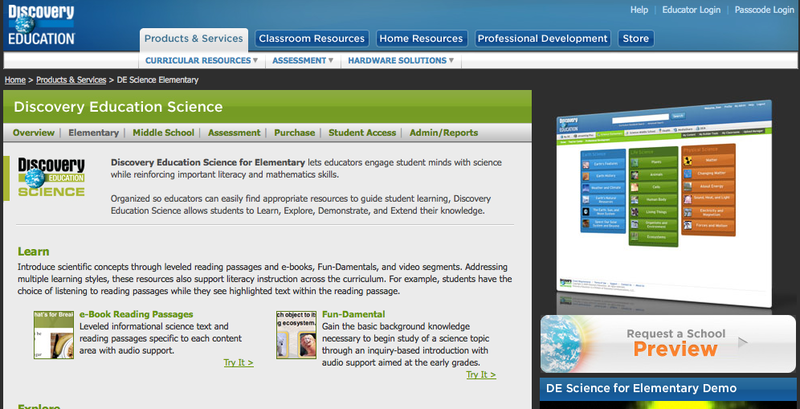 Also in the same time slot pitched to a different audience is one of Discovery Education’s truly great partnerships. Interested in acquiring a Masters Degree in Instructional Media Technology. Interested in learning with the very best. Of course you are! Then you want to go with the best, and that’s the Discovery Education partnership with Wilkes University. PA DEN STAR and Leadership Council Events Team member Jennifer Brinson is currently completing her degree work in this program, and with 2 courses out to the degree, I can tell you from all of her comments and her growth that this IS THE MASTERS PROGRAM you want. If you are teaching science or health in this time period, you just might want to give your students access to this timely and relevant topic, Healthy Classroom, Healthy Kids. Join us by registering here and discover a world of ways to reach and teach students science at the elementary school level. 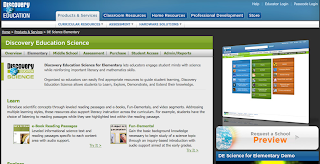 Discovery Education’s inquiry-based curriculum tool for science education. Structured differently than DE Science Elementary, this service is built around three core areas: physical science, life science, and earth and space science. Follow your webinar guide through the sub-categories to discover inquiry problems, conceptual explorations, and assessments. Learn how to navigate the sections to interact, watch, and read, using virtual labs, videos, and articles. The webinar also shows you how to use assignment builders and assessments to guide and measure your students’ understanding and mastery. Want a sneak preview about Dr. Larry Rosen’s upcoming webinar? Listen to this pertinent interview for Rosen’s definition on the iGeneration, how they learn, what i stands for, and how they are different from their previous generation, NetGen. You can also add an NPR app for your iPhone or iTouch, somehow very relevant for this particular webinar about the rewrired iGeneration. Check out the app in iTunes. And it’s available in an Android app as well. Check out SimplyDroid. It’s actually easier than an iPhone. 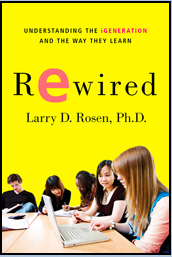 Now join us for Discovery’s WebEx special webinar by attending Rewired: Understanding the iGeneration and the Way They Learn, featuring Dr. Larry Rosen. Click here to register. Organized in grade bands, the content in this service is segmented into areas and lesson plans appropriate for students according to grade level. Participants in this webinar learn about the searching content, navigating lesson plans, and using supporting video. In addition to searching content, creating quizzes, assignments, and assessments are also demonstrated. Finally, participants can learn to use the Teacher Center to create a program library and maximize the use of interactive activities, such as eBooks, games, and puzzles. Register today by clicking this link. Well, there you have it. Lots of PD in one-stop shopping, learning and teaching with the very best!